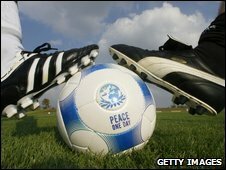 The German sportswear companies Puma and Adidas have ended a feud started 60 years ago by their founding brothers. Employees of both companies have shaken hands and then played a football match in the Bavarian town of Herzogenaurach, where both are based. Adi and Rudolf Dassler started making sports shoes together in their mother's wash-room in the 1920s. They fell out during World War II, probably over political differences, and founded rival firms. The match was the first joint activity held by the two companies since the brothers left their shared firm in 1948. It ended 7 - 5 but the teams were not split into Adidas and Puma - with both sides made up of staff from both companies. Adidas boss Herbert Hainer played as a striker for the winning team, which also included Puma chief Jochen Zeitz in goal. When the brothers set up their separate companies, the town was also split, with residents loyal to one or other of the only major employers. The two companies decided to make up in support of the Peace One Day organisation, which had its annual non-violence day on Monday. Neither group is now controlled by the descendants of its founding families, although Rudolf's grandson Frank Dassler raised some eyebrows in the town by working for both Puma and Adidas. Since 2007, Puma has been majority-owned by PPR, the French luxury goods maker that also owns Gucci. Adidas Group is much more widely-owned, with no individual shareholder having more than 5%.